The snow moves in overnight with light accumulations expected. BALTIMORE — Once again another Winter Weather Advisory is in place for Central Maryland as a quick moving system over the Ohio River Valley slides on through. The advisory will run from 4pm this evening through 4am Friday morning for snowfall accumulations on the order of a dusting to 2". 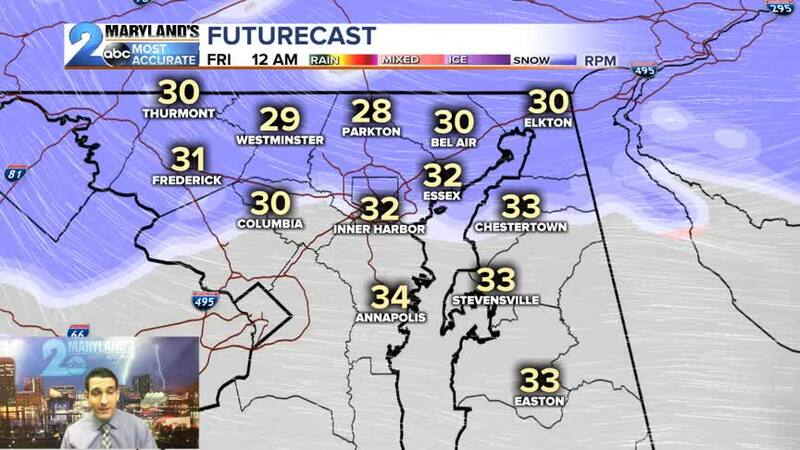 Prepare for slick travel concerns and school delays for some (north and west of Baltimore) early Friday morning. Wintry weather starts to move into the Baltimore metro and surrounding suburbs between 5-7pm Thursday evening. Most locations will start as light snow before a transitions over to moderate snow during the overnight hours. Further south of US-50 we are likely to see a mix of rain or snow as temperatures sit at or above freezing. Snow totals with this storm look to be fairly uniform across the area with the exception of Kent, Queen Anne's, and Cecil Counties where lesser amounts are expected. The reason for this is the fact that the storm center will be north and west of the area. So the farther south and east you go the better chance that you see a mix to rain as the easterly winds drag in some warmer air off the water. As of now Northern Maryland and Western Maryland are likely to see the highest accumulations. This is where Winter Weather Advisories are now in place and where the worst road conditions should be overnight into early Friday morning. Either plan accordingly for slick travel. Anything that does fall will stick on contact since the road surfaces are cold. Don't crowd the plows and don't travel if you have to during the peak of the storm. Road conditions should improve fast by Friday mid morning as temperatures come back above freezing. Afternoon highs Friday will be in the 40s. Snow moves by 3-5pm Thursday. Road conditions are likely to be impacted with school delays possible Friday. Temperatures hover around 27-31 degrees during the duration of the event. Areas around South Mountain and along US-15 toward the Catochtins could see amounts around 2". US-340 toward Boonsboro/Brunswick and I-70 West Hancock/Sideling Hill likely to see 1-2" amounts as well due to extra lift from the mountains. Snow moves in by 5-7pm with a gradual transition to moderate snow late Thursday night. Slippery roads are likely especially on elevated surfaces such as I-83 from the City north to Parkton. Problems are also likely to occur north of MD 136, MD 152, and the PA/MD line even with amounts there around 1-2". Most areas like Towson, Eldersburg. Taneytown, Monkton, Cockeysville, White Marsh, & Middle River are looking at Dusting-1" of snow. This will be a fluffy snow and easy to cleanup with a shovel or broom. Storm system departs pretty quickly Friday morning leaving in it's wake a thaw then another storm to follow for the weekend ahead. Precipitation types with that storm still have yet to be determined. Most models start as a mix to rain then a changeover to mostly rain through the overnight hours Saturday into Sunday.